It may seem like nothing has changed in Macedonia after Sunday's elections, but look closer and you will see the cracks forming inside the country. 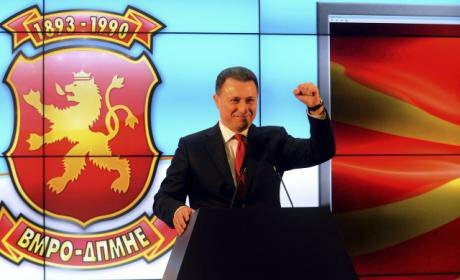 Nikola Gruevski, leader of the ruling conservative VMRO-DPMNE party, greets his supporters claiming victory. PAimages/Dragan Perkovski. All rights reserved. There is no particular reason why outsiders should pay much attention to early elections in a small, impoverished Balkan state like Macedonia, especially when the story is that nothing much has changed. But the outcome of yesterday’s elections tells an important truth about the strategic limbo which a crisis-stricken EU has created in the Western Balkans. Worse, as Brussels’ influence declines, the consequences of the election could turn Macedonia into a geopolitical battleground which extends beyond the country’s borders. With the votes now counted, the ruling Internal Macedonian Revolutionary Organisation (VMRO-DPMNE), has won its fifth parliamentary election in a row with 51 seats in Macedonia’s 123-member parliament. Meanwhile, within Macedonia’s large Albanian community, the Democratic Union for Integration (DUI) has again emerged as the largest party, with ten of the 20 seats that have gone to Albanian parties, its sixth consecutive parliamentary election victory. Two diaspora seats have not been allocated due to low turnout. After ten years of this ethnic duopoly, the latest results should not be remarkable. The difference this time, however, is that elections were preceded by the most serious political scandal in Macedonia’s short history as a state. This broke last year when the opposition Social Democratic Party of Macedonia (SDSM) leaked wiretapped recordings that apparently revealed evidence of espionage, corruption, criminality, electoral fraud and even the cover up of murder by the governing parties. That the two should still win out against this damning backdrop says much about the state of Macedonian politics. Most significantly, it speaks of the ruling parties’ ability to sustain a large support base by colonising the state and exploiting the local patronage system to reward allies and destroy opponents. Not only have the parties brought an array of institutions such as the civil service, the judiciary, prosecutor and the police under their direct control by reserving employment for party activists. But they have also extended their influence deep into the notionally private sector, forcing businesses to pay tribute and the media to pay homage to keep a predatory state at bay. None of this is surprising for those familiar with the old Yugoslavia. What is remarkable is only that Macedonia has managed to preserve the essential dynamics of the communist system, with its all-pervasive ruling party, so far into the twenty-first century. Although domestic factors play a part, primary responsibility for this situation lies with the EU, which has kept Macedonia at arm’s length for much of the last decade, allowing VMRO-DPMNE and DUI to capture the Macedonian state. Initially, the obstacle was Macedonia’s esoteric name dispute with Greece, which froze the country’s incipient accession to the EU and NATO. Subsequently, the crisis in the EU has deadlocked the entire enlargement process, destroying whatever residual hope Macedonia might have had for joining the union. In the background to this, some European governments have been happy to tolerate their capture of the state if government keeps migrants out and lets foreign investors in. The upshot is that the EU has been singularly unable to promote liberal reform inside Macedonia. VMRO-DPMNE and DUI have had little reason to co-operate with Brussels’ demands to open up the political system and instead have enjoyed free rein to pursue their interests, unencumbered by external pressure. This situation would be bearable for the rest of Europe if the effects of its actions could be contained within Macedonia’s borders Unfortunately, that may not be the case because, behind the façade of apparent stasis, a perfect storm is now brewing. The key actor in Macedonia’s drama is the large Albanian minority which is deeply disaffected; discriminated by a political system which relegates them to second-class status in a state run in the interests of Macedonians. For years, Albanians parked their grievances on the assumption that their political representatives, former paramilitaries from a short-lived struggle for Albanian rights back in 2001, had the interests of their community at heart. Albanians have also put their faith in Macedonia’s eventual arrival in the sunlit uplands of the European Union. However, first EU enlargement was suspended. Then, with the wiretapping scandal, it became clear that DUI was far more concerned with making money by corrupt means than standing up for Albanian rights. As a result, a wave of Albanian anger has been unleashed, manifest in street protests, defections from DUI and new insurgent parties. Two of these polled well in yesterday’s elections on a platform of greater rights and territorial autonomy including, potentially, the federalisation of the Macedonian state - but not, apparently, enough to break into the captured political institutions. This is highly significant. If enough Albanians conclude that the formal means to realise political change are blocked, there is a real risk that some will once again resort to violent agitation, as they did when their patience last snapped, back in 2001. Even if they do break the blockade on the institutions, matters will not rest. Having fallen one seat short of a majority, it is possible that VMRO and DUI fail to form a government, allowing SDSM, which has just won 49 seats, to form a coalition involving every other party – perhaps even DUI too, if it decided to recalculate its interests. But while this would end the current political duopoly, it would also bring the Albanian question to a head. To woo Albanian voters ahead of the ballot, SDSM committed to a new deal for Albanians, which it would be under pressure to honour, especially from the insurgent Albanian parties which would join the coalition. Failure by SDSM to meet its promises would cause bitter disappointment and compel some Albanians to resort to violence. This is where the EU’s neglect of Macedonia would become an encouragement to others to fill the void that Brussels has vacated. Turkey for one is keen to fill the emerging political vacuum. For years, it has invested energy in winning the hearts and minds of disaffected Muslims as an alternative to the West and a bulwark against Russia. To complicate matters further, if Macedonia’s Albanians press their demands for a new deal, then VMRO-DPMNE is likely to rally Macedonians in opposition to this, supported by Russia which, like Turkey, views Macedonia as an open front on which it can advance. For the moment, Russia and Turkey may be allies but their temporary marriage of convenience is unlikely to survive the end of Islamic State and the question of who rules Syria. In such circumstances, Macedonia could easily become a proxy for a new contest for influence in the Middle East, this time in the EU's backyard. In the meantime, regional states are unlikely to stand idly by and let Turkey and Russia decide the fate of Macedonia. Too much is at stake. As its hopes of joining the EU evaporate, Albania is already starting to focus on the plight of Albanians in the region - and will do so even more if they call on Tirana for help. The same goes for Kosovo. Meanwhile Serbia, Bulgaria and Greece - all concerned neighbours of Macedonia - are carefully monitoring developments. All this leads to a worrying conclusion. Not only is Macedonia’s journey from a relatively stable and Western-orientated multi-ethnic democracy to a captured semi-autocracy a graphic testament to the failings of the EU project. But with the EU unable to exert any meaningful influence in the Balkans, the internal stability of the country is becoming increasingly precarious. Sunday’s election is probably not the end of the political crisis as the EU intended. More likely, it is the beginning of a new and more dangerous phase which could spread far beyond Macedonia’s borders.